Today's Draw: Cross in the House of Clover using the Original Lenormand (Greenie) and the Deck of Lenormand Houses. Do you consider yourself lucky? Does your luck seem fairly consistent or does it go up and down? Do you believe some people are just unlucky? One of the things about Lenormand is that one reader will tell you this combo means "an end to your luck" while another reader will say it means "spiritual blessings". The Cross can mean ending, a burden or cross to bear, destiny or religion. 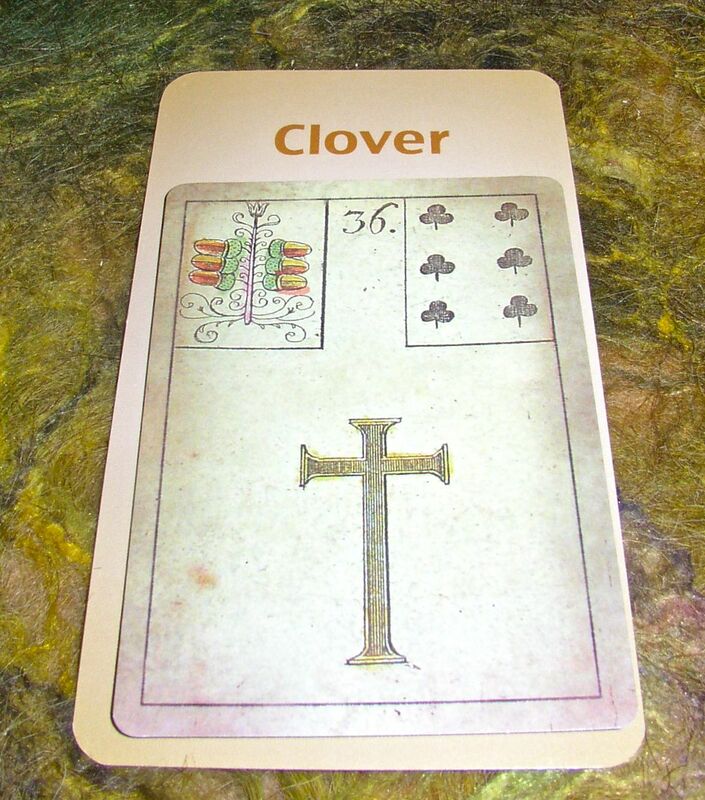 The Clover can mean luck, opportunities, blessings or happiness. So Cross in the House of Clover could be an ending in your house of luck. Or destiny in your house of opportunity. You really just have to go with your first instinct. And mine, oddly enough, was "luck is your cross to bear." Believe you have luck. Remember Tinker Bell? She couldn't exist unless you believed in her. Luck is the same way. Believe you have it and it will come. While you're at it, go one step further and EXPECT luck. And scrub the toilet in case luck is bloated when it arrives. Focus on the positives in your life. If you're "unlucky", chances are you spend too much time focusing on what you don't have and not enough time focusing on what you do. Switch that around and you'll see you have more luck than you previously thought. Practice gratitude. This is another way of focusing on the positives in your life. Only it gives more power to your positiveness. And if there's one thing luck likes, it's hanging around with positive, grateful folks. Trust that everything happens for a reason that benefits you. Sometimes what looks like crap luck is actually a short course adjustment on the path to SUPERLUCKYLUCK. And if you give up now, you'll miss all the popcorn and confetti. So don't give up. Try, try again. Ask for what you want. Sounds simple. And it is. If you want something, ask for it! That alone may set luck running toward you. But if not, actually putting a voice behind your desires makes them official and gives your desires more thrust in the universe. Do your work. This is the "cross to bear" part. Moving toward your desires, readying yourself to meet opportunities, practicing for your closeup—heck, any movement at all—catches the leprechauns' attention and tells the fairies where to dust. Duh. Trust your hunches. If a hunch feels good, do it. If you've got a hunch things will turn out bad, don't do it. You've got a built-in luck meter. Consult it. And then consult Lucky Way #4. They've actually done research on what makes lucky people lucky. As suggested above, it's believing in luck, being prepared for opportunity, trusting your gut and accentuating the positive. That's about as close as we get to the science of luck. But it does point toward luck being made by the individual and not by some mysterious outside force. So if you find yourself lacking in the area of luck, maybe it's time to use your rabbit's foot to give yourself a good old-fashioned kick in the arse.